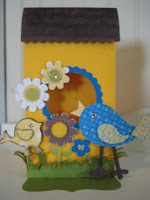 I made this adorable Birdhouse using Gretchen Barron's tutorial. You can purchase this one and others for just $5.00. I will show you tomorrow the cute cards that fit inside. I made 4 of these. 2 are going to my daughter's preschool teachers. I can't believe next week is the last week of school. Another goes to my friend Eve (Dr. Sachs my husband would say). And of course the other is for me. Yes that is right for me! I unfortunately did not have all the materials that this project called for so I improvised...For example the green middles of the flowers are suppose to be Kiwi Kiss corduroy buttons but I didnt have any so I used the Kiwi Kiss paper in the Good Morning Sunshine DSP to make the circle and then I glued on to the chipboard circle to give it dimension....I need to buy corduroy buttons! You can have one TOO! Just place a $50.00 order with me in July and you'll receive this cute birdhouse and 4 matching cards...Colors may vary. I AM IN LOVE with this! Super job on the paper/ink choices, just perfect! OH MY GOSH!! This is awesome!!!! So bright and happy! I love it, this is too darn cute!